Open source tech that could reshape mobile connects a West Papua village to the world. Deep in the jungles of West Papua’s central highlands, there is a village with its own mobile telecommunications network. That network runs in a box latched to the top of a tree, providing the only reliable cell coverage anywhere within a four-hour drive. This small setup has created a booming local mobile economy—and it could be the harbinger of a whole new class of private and community mobile networks that change the shape of mobile for those who have been underserved or overcharged by traditional phone carriers. The single “tower” cell network is the work of graduate students from the University of California at Berkeley’s Technology and Infrastructure for Emerging Regions (TIER) research group, under the direction of Professor Eric Brewer—the founder of the content delivery network Inktomi. The group built its mobile solution with software developed in San Francisco and some off-the-shelf hardware adapted for the task. Working with the Methodist church-owned school Misionaris Sekolahin and local merchants, a TIER team led by graduate students Kurtis Heimerl, Shaddi Hasan and Kashif Ali gave this village of about 1,500 people its first local phone network—and a much-needed connection to the outside world. The company’s new CEO sees white space spectrum as a huge opportunity to create private mobile networks in unlicensed spectrum. It could dramatically change the face of mobile communications for billions of people in developing countries around the world, and it could potentially have a similar impact here in the US—if it doesn’t get squashed by governments and phone companies in the process. OpenBTS is “not just open source mobile, but open mobile,” said new Range Networks CEO Edward Kozel. Kozel joined the company on January 28, and he knows a thing or two about networking. He was chief technology officer and a senior vice president of business development during his 12-year tenure at Cisco, and he arrived at Range after serving as Deutsche Telekom’s chief technology and innovation officer. Kozel sees OpenBTS as providing the same opportunity that TCP/IP created in networking. “With TCP/IP, nobody owned the standard, so you had innovation up and down the stack.” With OpenBTS, he said, “you have the source code and complete access to the stack and can apply it in different ways. Before, you took what AT&T or Verizon had or you didn’t have mobile. Now you can roll your own applications.” The company's current products are all 2G and 3G GSM, but a 4G LTE product is in the works as well. The airwaves are not quite as open a domain as the Internet—spectrum licensing and a global tangle of government regulations have seen to that. But the GSM standard itself is like TCP/IP—an open standard that can be used to do a lot more than operate large commercial mobile networks. The fundamentals of GSM are “the underpinnings of an agile frequency management regime,” Kozel said. “In rural areas, a carrier could sublet some of their frequencies to a small local operator using a white space implementation.” One of the first advantages of GSM is simply the number of 2G and 3G handsets already out there that work with it worldwide. And some of that spectrum is opening up or has never been used in parts of the world. “They’ve deregulated GSM spectrum in some European countries—for example, there are some GSM channels in Sweden that don’t require license,” Kozel said. For rural environments, where the government allows it and Telco providers don’t operate, small mobile providers could be set up using existing phones without much effort. And that’s just what TIER has done in West Papua. But the work done by OpenBTS developers, Heimerl, and his TIER colleagues has also laid the groundwork for a different sort of open mobile. They're ready to exploit unlicensed spectrum. Kozel said Heimerl’s work is the foundation of a “GSM white space implementation,” which evolves the current GSM specification to allow for operation in frequency ranges not normally reserved for mobile phones. There was no need for custom handsets in Papua. The TIER project is the first step in an attempt to create a small-scale sustainable community phone network in a place where there isn’t even reliable electricity. It’s already surpassed that goal. “This network is well beyond sustainable and into profitable,” Heimerl told Ars during a meeting at Range’s offices. Within days of being launched in February 2013, TIER had over 100 customers and was up over 500 within six months. “We sell a SIM card every one or two days in the village now,” he said. The profit helps pay for the operation of the school, and it has created a new source of income for local merchants. The network has become a local currency itself thanks to a phone credit swap program developed by the TIER team. All this has happened without any help from Indonesia’s national telecommunications company. In fact, the phone numbers assigned to the phones in the village so that they can send SMS messages to the outside world are Swedish. The TIER team was introduced to Range Network’s technology about three years ago when Range founders David Burgess and Harvind Samra came to speak at UC-Berkeley about their technology. Burgess has since moved on to another company, called Legba, and he continues to build on top of the OpenBTS work in other ways. Legba is based in Romania, and it targets urban mobile networks that need to support 2.5G GSM and 4G LTE devices over the same infrastructure. The company is developing an OpenBTS “distro” called YateBTS that incorporates code from Null Team SRL’s YATE, an open-source SIP routing server used globally to plug in to VoIP network providers (including Google Voice). The system could help telcos deal with the dilemma of how to consolidate their networks while still supporting GSM and GPRS services. Having previously done some work with long-range Wi-Fi for rural networks, the OpenBTS technology caught the TIER group’s interest, and Heimerl decided to make it the focus of his doctoral dissertation. He wanted to demonstrate how the technology could help the economic development of emerging regions. “The first thing is connectivity to the outside world,” Heimerl said. “The research is there—there’s a bunch of work in economics on how important this is to these communities from the standpoint of sustainability.” But communications with communities, and the economic impact of that communication, was also a major part of the TIER plan. Its goal was to create a real mobile economy for an isolated community. So Heimerl, Hasan, and the others did about two years of additional development work on the platform to build a community-oriented platform that could be connected to an existing satellite or Wi-Fi network. The team went looking for a location to test the platform. 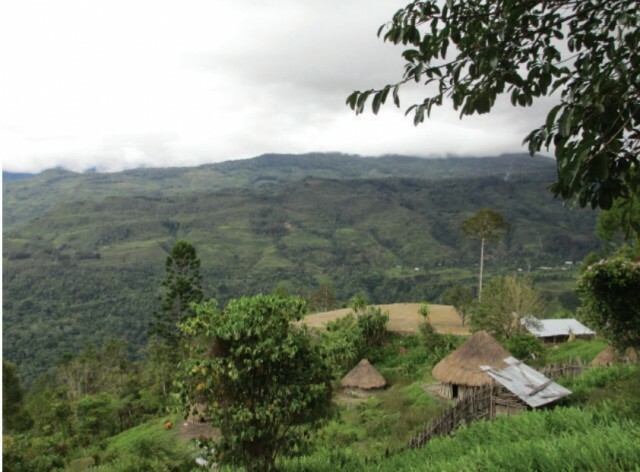 The location they found, through a chance connection with Misionaris Sekolahin, was a village in Papua—called “Desa” (which is Indonesian for “village”) by the TIER team to anonymize the location for research purposes. The Papuan jungle is, as Heimerl puts it, “as dense as it gets.” The village is in the middle of one of the most hostile environments to radio communications. The vegetation cuts down the range of cell phones dramatically, and there is no village-wide power grid or other infrastructure to speak of. Even so, there were some pre-existing factors that made Desa a good fit for the project. “Papua is a wonderful test bed,” said Heimerl. “It’s a very complicated place with a complicated history, but it gives us a lot of freedom to change variables we don't get in other places.” On the upside, the team knew quickly that there was already a ready-made customer base for the network. When they turned on their cell network for the first time, they saw the GSM handshake for over 400 mobile phones that were turned on and looking for a network. During a village celebration soon after that, the number went up to over 1,500. “That kind of existing infrastructure is enormous for adoption,” Heimerl said.